An old billhead from Aberdeen Motors in 1927. Homepage. This page: A smartly designed illustrated statement/billhead for this Scottish motor engineering company. Aberdeen Motors Ltd - Motor Engineers. 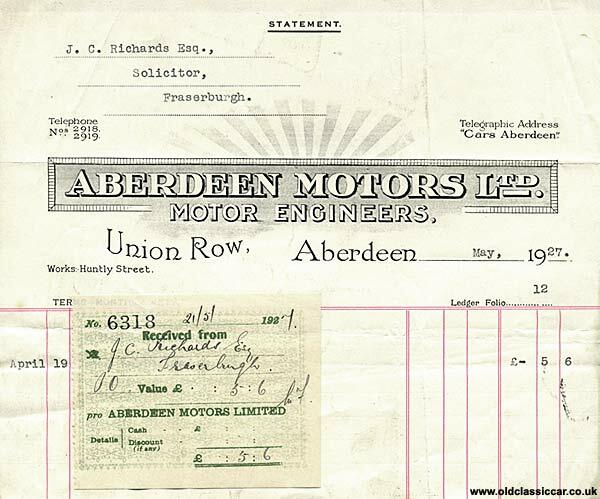 Quite a few illustrated invoices and receipts now feature in this section of the site, this illustrated statement was used by Aberdeen Motors Limited, of 40-44 Union Row in Aberdeen, and was issued in 1927 following the sale of 4 gallons of Shell Motor Spirit (ie petrol). The customer was J.C. Richards of Fraserburgh. Unusually for a garage in the 1920s, this illustrated piece of paper doesn't actually feature a motor-car, just a tastefully designed piece of artwork announcing the company's name. Also there is no mention of exactly what they do (just car repairs, or do they also cater for owners of motorcycles, lorries etc?). Many firms really went to town with listing their full range of services, so I'm surprised that Aberdeen Motors Ltd didn't do the same. A little research suggests that at one time a company called Aberdeen Motors were dealers in Rolls-Royce and Bentley motor-cars, although whether this was in the 1920s or later I'm not sure. By the 1960s they had diversified into the sales of BMC motor cars (such as Austin and Vanden Plas), as the period photograph I found on this other site illustrates, although this could be a different location as the building number is 254 . Note the reference still to Rolls-Royce and Bentley in Aberdeen Motors' window. I enjoyed visiting your site and will return having bookmarked it. Looking at the receipt from Aberdeen Motors caught my eye. The address in the photo link is 254 Union Street which is in fact the same premises as 40/44 Union Row, one being the front, the other the back. Union Row is parallel to Union Street (the main shopping street) which is where Aberdeen Motors had/have their showroom, and the showroom is the front part of a building which stretches back to Union Row, which is where the petrol pumps were, effectively at the back entrance. My memory of growing up in Aberdeen in the fifties is that this firm definitely were at the upper end of the market and that one would expect to see Rolls and or Bentley models in their showroom. I recently came across your website while searching for information on Aberdeen Motors - you have an article relating to a charming old document from them. In the article mention is made of their Rolls-Royce connection, which is where my interest came from. I have a rather tired Rolls-Royce Silver Shadow which my research (file from RREC) shows was originally delivered to them and registered ERG800D. It was the 76th Shadow (of some 30,000 produced) so would have been quite a novelty. Aberdeen Motors received a demonstrator discount from RR so I assume that this was its early life. The car was originally Astral Blue and Shell Grey so must have been a most impressive vehicle in its flush of youth. You may wish to update the article noting that AM were indeed active with R-R well into the 60's. I have been piecing together some of the car's early history - partly as insurance to ward off desperation that I should just sell of the parts rather than persist with any kind of restoration. As I am in Australia (as is the vehicle) the rust bug has not consumed the car although our fierce sunshine has made a bit of a meal of the soft trim. The paint on the horizontal surfaces has redefined "patinated"! The car runs and is pretty much complete so that is my consolation.